This work focuses on the development of three unique types of high vacuum shock tubes for materials research. Shock tubes of various types such as simple material shock tube (MST), with extension (MST-E) and with reduction (MST-R) are studied. The major aim of this paper focuses on the augmentation of test time (tIE), reflected shock pressure (P5), and temperature (T5) and to get an ideal shock strength for material interaction. The simple MST has a 2.1 m driver and 5.1 m driven sections of inner diameter 80 mm, MST-E has a driver extension of 2.3 m long, and MST-R is equipped with an area reduction at the end of the driven section having a convergent nozzle for shock focusing with an addition of 1.2 m long tube. All the experiments are performed with air as a test gas at 1.0 bar. The experimental results show a variation of tIE of about 10% between the simple MST and MST-E. The MST-R shows an increase of P5 and T5 of about 60% and 15%, respectively, in the presence of air. Experimental results are compared with the 1-D normal shock relations (NSR) and KASIMIR software for validation. The results also show about 10–40% discrepancy between experiments and the various tools in all configurations. 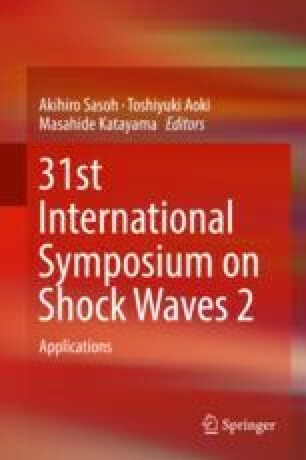 The experimental and theoretical results of all the three shock tube configurations are discussed in this paper. Financial supports from ISRO and STC-IISc, Government of India, are gratefully acknowledged. The authors thank Prof. K P J Reddy, Prof. G. Jagadeesh, and Mr. Abishek Khatta from the Department of Aerospace Engineering, Indian Institute of Science, Bengaluru, for their support and fruitful discussions on shock tube physics.